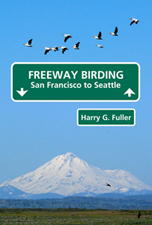 Freeway Birding author Harry G. Fuller is an unrelentingly devoted birder, and for over two decades he has shared his passion by leading field trips in California, Oregon and Washington. In his new book, Harry reaches out to the frustrated freeway-traveling birder with a little time to spare on the way from here to there, from a few extra minutes to a few extra hours. Learn how and where to find the birds within a few miles of the freeway corridor, so that one or more short stints of birding can be easily worked into your otherwise uninspiring interstate travels. Driving directions and 104 maps. Descriptions of facilities and habitats. Lists of species and their seasonality. MORE DETAILS on the Freeway Birding website. If you bird the Klamath Basin or Humboldt coast of northern California, you won't want to miss out on a middle Klamath River expedition, a bird-rich river corridor conveniently located in Siskiyou County, CA on the route between these two frequented birding destinations. Here there is an overlap of California coastal, Northwest and Great Basin species and a chance to see many Neotropicals. Author Bob has been observing the local birds for 30+ years. You will find everything needed to plan your trip! Overview of the River environment. Original line drawings by local artist Joey Russell. Descriptive summaries of habits and habitats of the over 200 locally occuring species. 304 pages. $16.00 (list $19.95). The definitive birding guide to northwestern California returns in an updated third edition. Author Stanley W. Harris is Professor Emeritus at Humboldt State University in Arcata, CA. He spent 33 years teaching ornithology, seabird ecology, waterfowl biology and management, wetland ecology and management and museum techniques. Stan is the author of more than 75 publications on ornithological subjects and has spent thousands of hours updating the newest edition of Northwestern California Birds. Covers 35,000 square miles of NW California. Detailed habitat descriptions & color photos. Easy-to-Read bar graphs. Maps to birding Hot Spots. 515 species. Local experts put together this full-color two-sided map with thirteen super birding tours throughout the whole county. Decorated with photos and drawings. An excellent companion to Klamath River Bird Finder (see above).Check out the Mt. Shasta Area Audubon. 27" x 40" in size. $8.95. Compiled in 2008 by Klamath River Bird Finder author Bob Claypole. Two sided, folds out to 8.5" x 14".